This week we are featuring new pre-orders from WETA, Diamond Select and Gentle Giant! 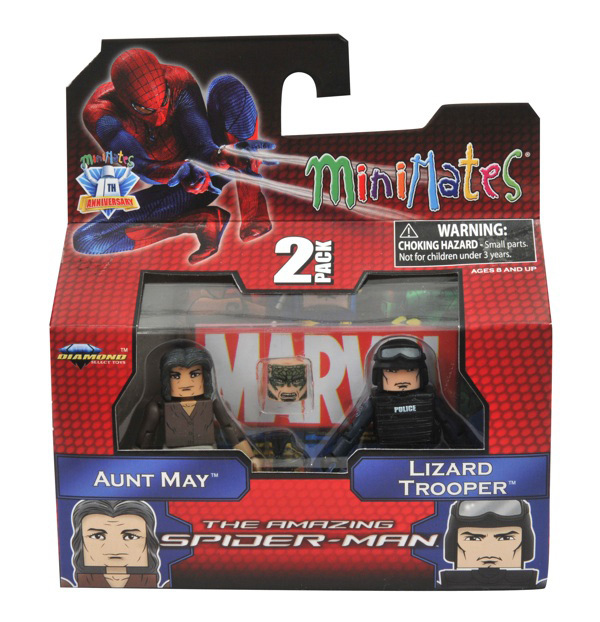 Amazing Spider-Man Minimates Pack Big Action into Small Packaging! May 24, 2012 - The Amazing Spider-Man movie is still a month off, but Spidey fans will be able to get their hands on great Spidey merchandise as early as next week! That's when Marvel Minimates Series 46 hits comic shops and online retailers, with the movie versions of Spider-Man, Peter Parker and the Lizard, plus exclusive figures of Aunt May, Uncle Ben and some Spidey-hunting SWAT Troops! If that's not enough for you, Spidey and the Lizard will also be showing up soon at Toys "R" Us stores and toysrus.com, along with TRU-exclusive figures of Gwen Stacy, Captain Stacy, Curt Connors and Vigilante Spider-Man! Collect them all, and check out the packaging for both assortments below! May 24, 2012 - Listed below are the toy (and child-related) recalls from this week; these links go to the official announcements on the Consumer Product Safety Commission web site. PAWTUCKET, R.I. -- May 23, 2012 -- Hasbro, Inc, and Paramount Pictures, announced today that G.I. JOE: RETALIATION will now be released in 3D. The film, originally slated for release in June 2012, is scheduled to be released March 29, 2013. "It is increasingly evident that 3D resonates with movie-goers globally and together with Paramount, we made the decision to bring fans an even more immersive entertainment experience," said Brian Goldner, Hasbro's President and CEO. 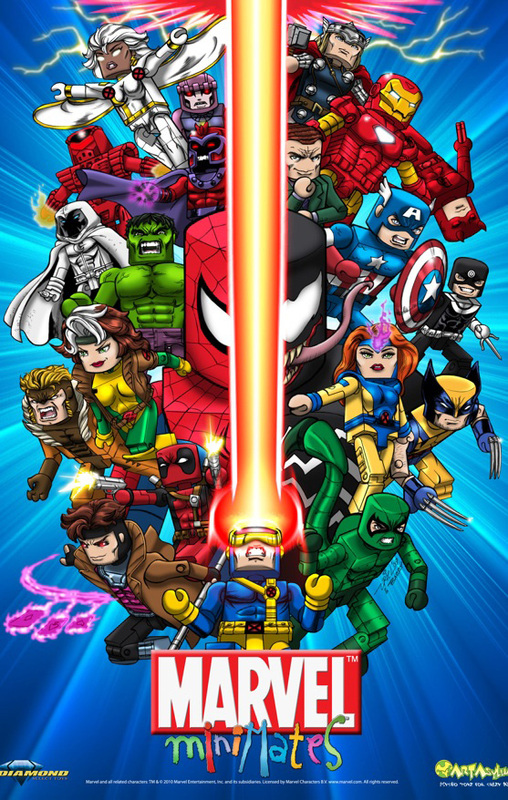 May 23, 2012 - The year 2013 marks the 10th anniversary of Diamond Select Toys' Marvel Minimates line, and will coincidentally see the 50th consecutive series of figures released at comic shops and specialty stores. To celebrate, DST wants to do something to recognize the fans who have supported the line over the years. And since there are so many fan-favorite characters who have yet to be made in the line, they're going to give those fans the power to decide the line-up for Series 50! This series will only be available at comic shops and specialty stores, and will be entirely composed of fan-voted characters! Hi - Here is a quick update from http://www.bigbadtoystore.com about a ton of exciting new preorders as well as a few new arrivals. We have put up a preliminary listing for the next Masterpiece Transformer. Sideswipe is currently listed at $139.99, although that price may change once we have further information. The second assortment of Delta vehicles from the upcoming movie includes the HISS Tank with Cobra Commander and the Ninja Combat Cruiser with Night Fox. They are available as a Case of 2 at $44.99; the new Ninja Combat Cruiser is also available at $24.99, as is the HISS Tank. The Amazing Spider-Man Toys Get Amazing Marvel Select Packaging! May 2012 - The packaging for Diamond Select Toys "Select"-scale toy lines is... pretty big. Okay, it's really big. But that's because it has to be! 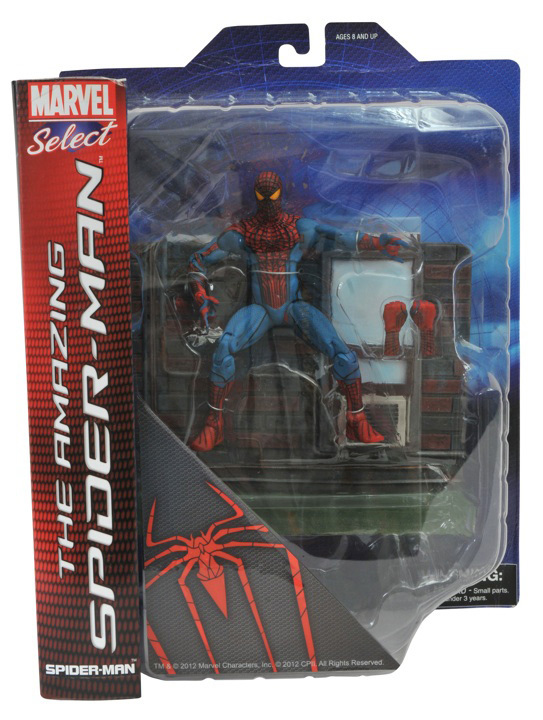 Ten years ago, DST designed their packaging to show off their 7-inch scale Marvel figures along with their killer display bases -- like the upcoming 6.75" Spider-Man figure from The Amazing Spider-Man, who comes with a wall-mountable awning to perch on. CULVER CITY, Calif., May 22, 2012 -- Sony Pictures Entertainment confirmed that six minutes of the highly anticipated film The Amazing Spider-Man™ will be shown in IMAX® 3D and other select theaters with Men In Black™ 3, it was announced today by Rory Bruer, President of Worldwide Distribution for Sony Pictures Worldwide Marketing and Distribution. The footage, which will play before the feature film, is available to fans during the engagement of Men In Black 3. Commenting on the announcement, Bruer said, "We're thrilled to give moviegoers a chance to get an extended taste of the movie in IMAX 3D and other select theaters. The audience for Men In Black 3 is a perfect match for this footage – there's something new here for everyone, and we think this six minutes of The Amazing Spider-Man will get everyone excited for what we have in store." Hi - a quick update to let you know about a few new items. Takara Masterpiece MP-12 - We've listed a preorder with preliminary pricing at $159.99 - we expect the price to drop and will adjust it downwards once final costs are known. 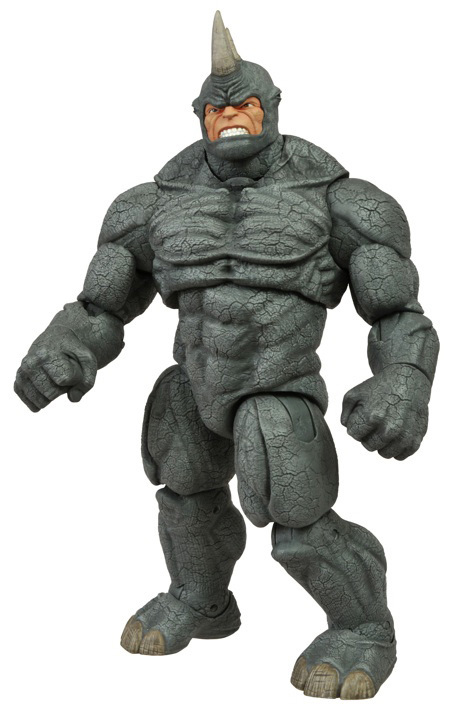 DST Unleashes Spider-Man Foe the Rhino on the Marvel Select Scale! May 2012 - The Hulk. The Thing. The Abomination. The Juggernaut. Diamond Select Toys' oversized Marvel Select action figures have been dazzling collectors for years, and now they're ready to do it again... with the Rhino! Designed and sculpted by Gentle Giant, the leather-skinned Spider-Man foe stands nearly 8.5 inches tall with 16 points of articulation, and is ready to tear through your Marvel Select collection like tissue paper. If you don't feel like having him stomp Spider-Man on your shelf, he'll come ready to display in the now-famous Select collector packaging, complete with side artwork for on-shelf storage. Pre-order him today at your local comic shop or your favorite online toy store, and look for him to hit stores in early 2013!